Saigal was blessed with a sonorous voice and a unique song style which made him Bollywood’s first legitimate ‘superstar’. He was an actor-singer, appeared in 36 films made in three languages, and sang 185 songs in his 15-plus-year career. Saigal wasn’t even a trained musician but was the gold standard for all the singing luminaries who came after him; indeed, many mimicked him. These include Mohammad Rafi and Kishore Kumar. “Saigal was the only person who could sing right from the lowest to the highest note. If there are four stanzas in a song, his scale would be different for every stanza. He could sing one line of a song in four different ways,” said Pune singer Shridhar Ranade, who has made a career of performing Saigal songs. Today’s Google doodle celebrates this golden-voiced son of India. 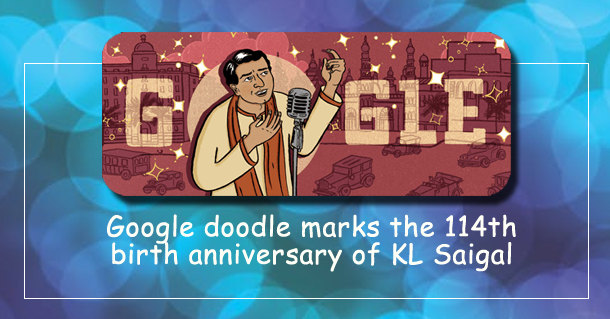 The doodle has been created by noted illustrator Vidhya Nagarajan.